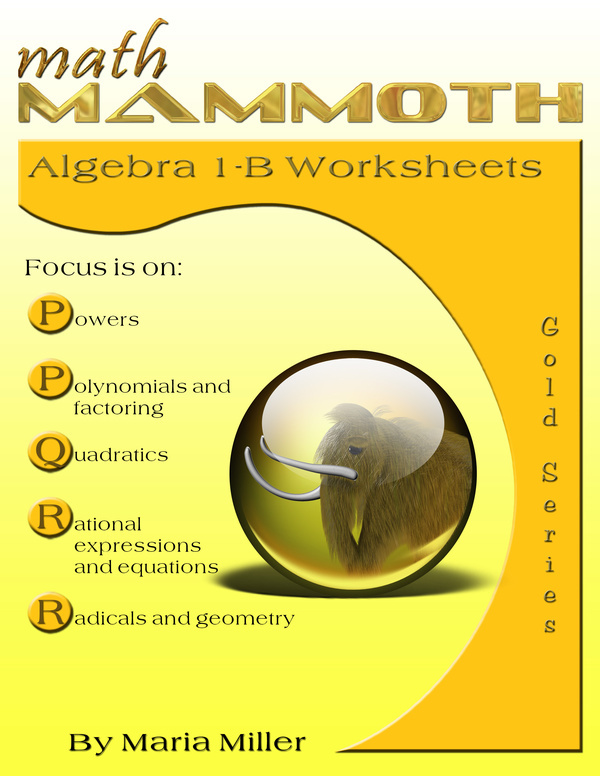 Math Mammoth Algebra 1 Worksheets - two reproducible algebra worksheet collections for 8th or 9th grade. Get both 1-A and 1-B for $13.00! You will be purchasing the value pack download from my authorized reseller Comecero, LLC. Math Mammoth Algebra 1 comprises two worksheet collections, 1-A and 1-B, covering all typical topics of algebra 1 course. The worksheets have been created especially for teachers: each problem sheet is one page, concentrating on one topic. Please note that these are worksheets collections and do not contain textbook explanations. So if you are a student, you cannot use these alone to learn algebra. These algebra worksheets have been "handicrafted" one by one. Each worksheet is on one topic, but contains varying problems about that topic. The problems include some that lead to a concept, basic practice problems about the topic on hand, and most worksheet also include 1-2 challenging problems. This collection contains a lot of word problems. In essence, the worksheets are like the problem section of a math book, and far from the mechanical worksheets created by a script. 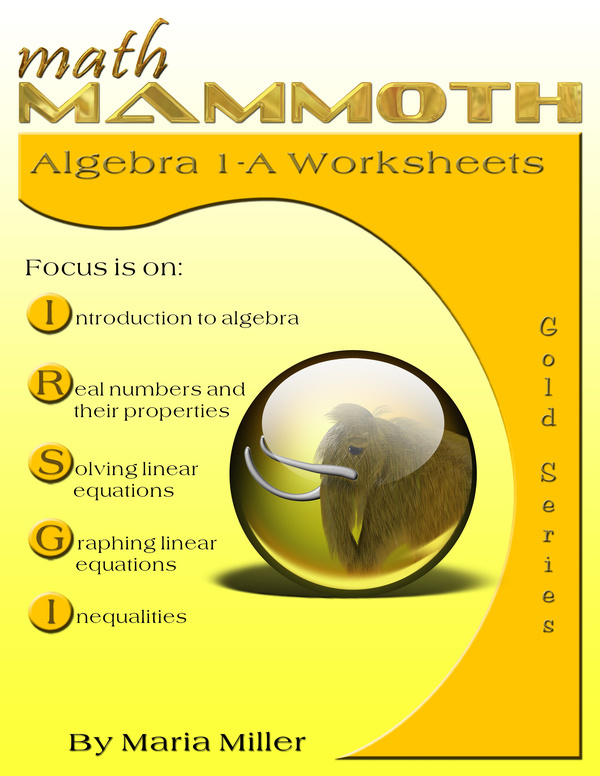 The collection 1-A covers the first half of a typical algebra 1 course topics. The first section of the book contains introductory problems about variables, expressions, translating words into symbols, and building equations. The second section covers basic properties of real numbers. Next follows a section on solving linear equations, which also covers ratio, proportion, and percent problems. I have also included lots of word problems here. The next section, Graphing Linear Equations and Functions, starts with problems about relations, then has worksheets for all the graphing-related concepts, such as slope and parallel and perpendicular lines. Lastly in this section I have included three worksheets about modeling with linear equations. The next section concentrates on solving and graphing linear inequalities including absolute value inequalities. Lastly in this collection we have systems of linear equations and inequalities. This collection covers the latter half of a typical algebra 1 course topics, starting with exponents and powers, and introductory problems on exponential functions. Next follows a section on polynomials and various factoring techniques. The next section, Quadratic Equations, includes graphing quadratic functions, solving quadratic equations, various applications (word problems), and using the discriminant. Then comes a section called Rational Expressions and Equations, and the last section covers radical expressions, radical equations, Pythagorean theorem and its applications. 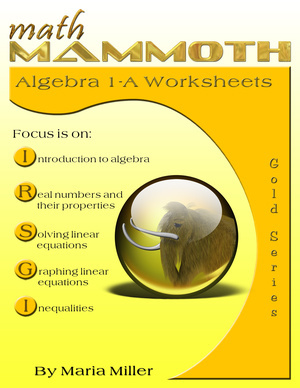 This collection also contains 8 review worksheets that cover the entire algebra course. See also Linear Functions I and Linear Functions II workbooks from the Make It Real Learning series.